Koru Cottage - Pristine and newly renovated. 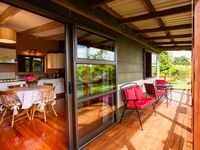 Property 35: Koru Cottage - Pristine and newly renovated. A Noble View. Comfortable 3 bed-roomed home with sweeping harbour view. Property 44: A Noble View. Comfortable 3 bed-roomed home with sweeping harbour view. Property 46: Sunny comfortable holiday home. Thank you so much to Faye &amp; Ian for your lovely hospitality this past weekend. My partner and I thoroughly enjoyed waking up to the sound of birds chirping and the beautiful waterfall after a blissful nights sleep. I highly recommend this Bed&amp;Breakfast, especially if your looking to escape to a location that offers peace and quiet in relaxing environment. With the added perk of a tennis court. 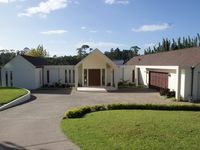 In addition to this lovely Bed&amp;Breakfast, we experienced friendly customer service from the Kerikeri 4Square, BP and Makana Chocolate Cafe&amp;Shop. Kerikeri Markets also offer fresh produce, baking and much more on a Sunday morning, which can be located across the road from the famous Makana Chocolate Cafe and Shop. They also have another larger market on a Saturday in a different location.